2015 Commission letters and agency responses are provided as PDF files below. Download times of large PDFs will vary based on connection speed. Additional information on PDFs. Draft 2015 marine mammal stock assessment reports. Application from Alaska SeaLife Center to collect, rescue, transport, rehabilitate, and release to the wild northern sea otters and walruses in Alaska. Draft Ecosystem-based Fisheries Management Policy Directive. Application from the Partnership for the Interdisciplinary Study of Coastal Oceans to take marine mammals incidental to rocky intertidal monitoring surveys in California and Oregon. Application from Stephen Trumble to amend his permit to import, receive, possess, and export parts from whales. Application from Todd Robeck to amend his permit to import, receive, possess, and export parts from numerous marine mammal species. Application from Jennifer Burns to amend her permit to collect, import, receive, possess, and export parts from pinnipeds. Application from the U.S. Navy to take marine mammals incidental to construction at the Bravo Wharf in Mayport, Florida. Application from Northeast Gateway Energy Bridge and Algonquin Gas Transmission to take marine mammals incidental to operating, maintaining, and repairing Liquefied Natural Gas port and the Algonquin Pipeline lateral facilities in Northeast Gateway and Algonquin in Massachusetts Bay. Application from Lamont-Doherty Earth Observatory to take marine mammals incidental to conducting a geophysical survey off Brazil. Draft status review of the Sakhalin Bay-Amur River beluga whale. Draft Programmatic Damage Assessment and Restoration Plan and Programmatic Environmental Impact Statement for the Gulf of Mexico. Application from Southwest Fisheries Science Center to conduct research activities on cetaceans and pinnipeds in the Pacific, Atlantic, Arctic, Southern, and Indian Oceans. Revised draft environmental assessment regarding options to protect Florida manatees using the Three Sisters Springs Unit of the Crystal River National Wildlife Refuge. Environmental Studies Plan for Fiscal Year 17. Proposed List of Fisheries for 2016. Proposed rule to revise its regulations to implement the import provisions of the Marine Mammal Protection Act. Application from St. George Reef Preservation Society to harass marine mammals incidental to conducting restoration and maintenance of a lighthouse in Del Norte County, California. Application from Dan Engelhaupt to amend his permit to conduct research on marine mammals in Atlantic and Pacific Oceans. Application from Point Blue Conservation Science to amend its incidental harassment authorization to take marine mammals incidental to conducting seabird research activities in California. Amendments to the Appendices to the Convention on International Trade in Endangered Species of Wild Fauna and Flora for the Seventeenth regular meeting of the Conference of Parties. Draft Polar Bear Conservation Management Plan. Application from Ari Friedlaender to modify his authorization under the Antarctic Conservation to conduct research on numerous cetacean species in Antarctica. Application from John Downer Productions Ltd. to film northern sea otters in Alaska in 2016. Proposed rule regarding experimental populations under the Endangered Species Act. Application from Robert Pitman to modify his permit to conduct research on cetaceans in Antarctica. Application from Daniel Costa to conduct research on pinnipeds in Antarctica. Draft Funded Priorities List for Gulf of Mexico restoration activities under the RESTORE Act. 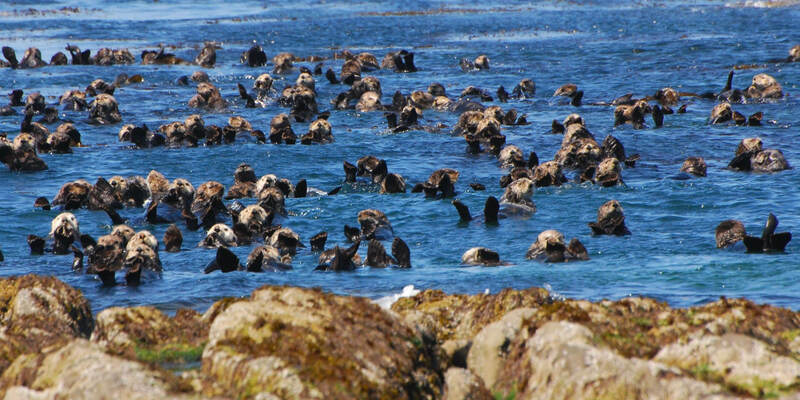 Application from U.S. Geological Survey to amend its permit to conduct research on sea otters in California. Application from Monterey Bay Aquarium to amend its permit to conduct research on sea otters that have been rescued from the wild, are undergoing rehabilitation, and could be returned to the wild in California. Application from Iain Kerr to conduct research on cetaceans in the Pacific and Atlantic Oceans. Application from Lamont Doherty-Earth Observatory to take marine mammals incidental to a 2D and 3D geophysical survey in the eastern Mediterranean Sea. Application from Alaska Department of Transportation and Public Facilities to take marine mammals incidental to construction activities at the Kodiak Ferry Terminal in Kodiak, Alaska. Application from U.S. Navy to take marine mammals incidental to conducting Civilian Port Defense exercises in California. Application from Angela Sremba to collect bone samples in Antarctica and the South Shetland Islands. Application from Colleen Reichmuth to conduct research on captive pinnipeds, including hearing and temporary threshold shift studies. Application from U.S. Navy to take marine mammals incidental to a pier replacement project at Pt. Loma Naval Base in California. Notice of intent to prepare a programmatic environmental assessment regarding the issuance of incidental take authorizations in Cook Inlet, Alaska. Proposed draft principles for determining seafood species at risk of illegal, unreported and unregulated fishing and seafood fraud. Application from Peter Tyack to conduct research on odontocetes in the North Atlantic and North Pacific Oceans and Mediterranean Sea. Draft environmental assessment regarding reducing manatee harassment in the Three Sisters Springs Unit of the Crystal River National Wildlife Refuge. Application from U.S. Navy to take marine mammals incidental to a wharf repair project in Mayport, Florida. Applications from Spectrum Geo Inc., TGS-NOPEC Geophysical Company, ION GeoVentures, and TDI-Brooks International Inc. to take marine mammals incidental to geophysical surveys in the Atlantic Ocean. Revised draft guidance regarding the acoustic thresholds for activities causing an onset permanent threshold shift and temporary threshold shift for marine mammal species under NMFS’s jurisdiction. Supplemental environmental impact statement regarding possible changes to regulations governing subsistence harvest of northern fur seals on St. Paul Island, Alaska. Application from Daniel Costa to amend his permit to conduct research activities on California sea lions from California to Washington. Application from Northeast Fisheries Science Center to take marine mammals incidental to fisheries research activities in the Atlantic Ocean. Application from Bergerson Construction, Inc., to take marine mammals incidental to construction of a new transload facility in Newport, Oregon. Application from Terrie Williams to conduct research activities on marine mammals held in permanent captivity or during rehabilitation. Application from Southeast Fisheries Science Center to amend its permit to conduct research on cetaceans in the Atlantic Ocean, Gulf of Mexico, and Caribbean Sea. Application from Washington State Department of Transportation Ferries Division to take marine mammals incidental to replacement of the Mukilteo Multimodal Ferry Terminal in Mukilteo, Washington. Application from U.S. Army Corps of Engineers, Portland District to take marine mammals incidental to a jetty rehabilitation project at the mouth of the Columbia River. Application from California Department of Transportation to take marine mammals incidental to demolition of Pier E3 of the old San Francisco-Oakland Bay Bridge. Application from U.S. Navy to take marine mammals incidental to maintenance projects at Piers 6 and 4 at Naval Base Kitsap in Bremerton, Washington. Application from Florian Schulz to conduct filming activities on polar bears in Alaska. Application from NEFSC to amend its permit to conduct research on pinnipeds along the U.S. east coast. Application from Douglas Nowacek to amend his permit to conduct research on cetacean species in the North Atlantic, North Pacific, and Southern Oceans. Draft Environmental Impact Statement regarding the Makah Tribe’s request to resume hunting gray whales. Application from ExxonMobil Alaska LNG LLC to take marine mammals incidental to a geophysical and geotechnical survey in Cook Inlet, Alaska. Proposal to revise the global listing of humpback whales as endangered under the Endangered Species Act. Draft Cook Inlet Beluga Whale Recovery Plan. Application from Melissa McKinney to import, receive, possess, and export samples from polar bears and walruses. Application from Cornell University to import, receive, and possess DNA samples from cetaceans and pinnipeds. Application from U.S. Geological Survey to amend its permit to conduct research on walruses in Alaska. Revisions to National Bycatch Strategy. Application from Kathleen Colegrove to import, receive, and possess samples from cetaceans and pinnipeds. Application from Melissa McKinney to import, receive, possess, and export samples from cetaceans and pinnipeds. Application from the University of Florida to import, receive, possess, and export samples from cetaceans and pinnipeds. Proposed rule to revise National Standard Guidelines 1, 3, and 7 of the Magnuson-Stevens Fishery Conservation and Management Act. Letter to NMFS regarding Regional Fishery Management Council decision on marine mammal bycatch that is inconsistent with TRT recommendations. Draft Hawaiian Island Humpback Whale National Marine Sanctuary’s Management Plan. Application from the Navy to take marine mammals incidental to training and testing activities to be conducted within the Northwest Training and Testing study area. Application from BBC to conduct filming activities on odontocetes and pinnipeds in California for Big Blue Live. Application from Hilcorp Alaska, LLC, to take marine mammals incidental to a geohazard survey in Foggy Island Bay, Beaufort Sea, Alaska. Application from Daniel Costa to conduct research on northern elephant seals in California, Oregon, and Washington. Development of a port access route study for the Chukchi Sea, Bering Strait, and Bering Sea. Application from the California Department of Transportation to take marine mammal incidental to conducting dismantling activities associated with replacement of the San Francisco-Oakland Bay Bridge in California. Application from SAExploration, Inc., to take marine mammals incidental to a seismic survey in the Alaskan Beaufort Sea. Application from the Alaska Department of Fish and Game to conduct research on walruses in Alaska. Application from the Marine Mammal Health and Stranding Response Program to conduct various activities on marine mammals. Application from BBC to conduct filming activities on sea otters in California for Ocean. Application from BBC to conduct filming activities on sea otters in California for Big Blue Live. Application from Breezy Media USA to conduct filming activities on killer whales and beluga whales in Alaska. Application from the Navy to take marine mammals incidental to a wharf construction project in Hood Canal at Naval Base Kitsap in Bangor, Washington. Request from Deepwater Wind Block Island Transmission, LLC and the Narragansett Electric Company to transfer an existing authorization for the take of marine mammals incidental to construction of the Block Island Transmission System. Draft 2014 National Marine Fisheries Service Stock Assessment Reports for marine mammals occurring in U.S. waters. Application from HDR, Inc., to conduct research on ice seals in Alaska. Application from Robert Rockwell to import, possess, and export samples from polar bears. Application from Alaska Department of Fish and Game to conduct research on cetaceans in the Arctic. Application from Bureau of Land Management to take Steller sea lions incidental to a land survey on a small island within the eastern Aleutian Islands archipelago. Proposed rule to expand North Atlantic right whale critical habitat. Application from SAExploration to take marine mammals incidental to a seismic survey in Cook Inlet, Alaska. Proposed amendments to regulations governing the Atlantic Large Whale Take Reduction Plan. Application from Glacier Bay National Park to take marine mammals incidental to seabird research. Application from Apache to take marine mammals incidental to seismic surveys in Cook Inlet, Alaska. Application from Bruce Mate to amend his permit to conduct research on marine mammals worldwide. Application from Lamont-Doherty Earth Observatory to take marine mammals incidental to a marine geophysical survey off New Jersey. Application from Huna Totem Corporation to take marine mammals incidental to construction activities at the Icy Strait Point Cruise Ship Terminal in Hoonah, Alaska. Application from Shell to take marine mammals incidental to exploratory drilling in the Chukchi Sea, Alaska. Application from Shell to take marine mammals incidental to ice overflight surveys in the Chukchi and Beaufort Seas, Alaska. Application from Scripps Institution of Oceanography to take marine mammals incidental to a marine geophysical survey off New Zealand. Proposed rule for Arctic ringed seal critical habitat. Application from Minnesota Zoological Garden to conduct research activities on captive Hawaiian monk seals. Application from James Shine to amend his permit to import, receive, and possess samples from long-finned pilot whales. Draft Proposed Program for the 2017-2022 OCS oil and gas leasing program and notice of intent to prepare a programmatic environmental impact statement. Application from the Sonoma County Water Authority to take marine mammals incidental to estuary management activities at the Russian River in California. Application from the Washington Department of Transportation Ferries Division to take marine mammals incidental to construction activities at the Anacortes Ferry Terminal in Washington. Application from Dolphin World Productions Ltd to conduct filming activities on bottlenose dolphins in Florida. Application from Leslie Cornick to conduct research northern fur seals on St. Paul Island, Alaska. Application from Texas Sealife Center to conduct research on dolphins in Texas waters. Environmental assessment for commercial wind lease issuance and site assessment activities off North Carolina. Draft environmental impact statement for construction and operation of land-water interface structures and a service pier extension at Naval Base Kitsap in Bangor, Washington. Application from the Southwest Fisheries Science Center to take marine mammals incidental to fisheries research activities. Proposed rule for implementing the Standardized Bycatch Reporting Methodology Omnibus Amendment for fisheries of the northeastern United States. Application from Randall Wells to amend his permit to conduct research on dolphins in the Gulf of Mexico. Application from Tom Smith to conduct research activities on polar bears in Alaska. Application from Navy to take marine mammals incidental to Joint Logistics Over-the-Shore training activities conducted in Virginia and North Carolina. Application from Allyson Hindle to receive, possess, import, and export samples from marine mammals under National Marine Fisheries Service jurisdiction for purposes of scientific research. Application from Washington State Department of Transportation Ferries Division to take marine mammals incidental to retrofitting activities at the Vashon ferry terminal in Puget Sound, Washington. Assessment of the sustainability of the Northeastern Tropical Pacific purse seine tuna fishery. Implementation of recommendations to the Presidential Task Force on Combating Illegal, Unreported and Unregulated Fishing and Seafood Fraud. Notice of intent to prepare guidelines for safely deterring marine mammals from damaging gear, catch, or property or endangering personal safety.